The leather is of proper thickness compared to other similar products. But one of the bands on mine has the consistency of rubber and became thin/stretched out in a short time and will undoubtedly break in little time. The only solution seems to be to order a cat/dog collar of similar size to replace the faulty band. The only other issue which most many not think of is the break in process. 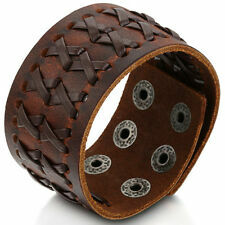 It digs into your wrist until it softens up and conforms to you like any other leather product. I suggest conditioning it properly with coconut oil and beeswax along with a good shoe polish in order to assure it lasts a long time. This is the second one I bought to have as a backup. The quality of the leather is excellent and a great value. I will be ordering another in brown for a friend. Love theses wristbands. Good quality and durable for a great price. Couldn’t ask for more. Thanks guys.